Isn’t it so pretty and yummy looking! It smells and feels amazing but NO you CAN NOT eat it! For those with fine hair (such as myself) I do have to say that you might want to watch how much whipped butter you apply and the ratio of the ingredients used because otherwise you might end up with weighed down greasy limp curls (not a good look). Those with thicker or coarser hair strands can be a little more heavy handed without worrying that their curls will look lifeless and flat. I have so much to say about butters but I am keeping things simple. I recorded how I make my Whipped Cocoa, Shea and Mango Butter and have it on my YouTube Channel. The video demonstrates exactly how I mix everything along with the exact amounts of each ingredient. I have listed the ingredients I use below for your reference. First I melt down the Cocoa butter in a double broiler on low heat until it’s nearly fully melted. Then add the Shea & Mango butter to the bowl. The melted Cocoa butter helps to melt the rest (I leave it on the stove for 5 minutes on low heat). I transfer the butters into a bigger bowl and add about half of the carrier oils (I like to add the oils in stages instead of all in one go). I add 2 tablespoons of Grapeseed Oil, 3 tablespoons of Virgin Coconut Oil, 2 tablespoons of Almond Oil, whisk everything to make sure the oils and butters are well combined and then put it in the fridge for 15 minutes. After 15 minutes in the fridge, I start to whip the butter which looks like caramel (it’s a little firm on the outer edges and soft in the middle). I whip for a good 10 minutes on medium and high settings and add 3 capsules of Vitamin E oil (1/2 teaspoon), 1 teaspoon of Glycerin and 10 drops of Peppermint Essential Oil. I return the mix back to the fridge for 5 minutes. I take the butter out and add the remaining carrier oils – 2 tablespoons Virgin Coconut Oil, 1 tablespoon Almond Oil & 1 tablespoon Grapeseed Oil and whip the mix for 5 more minutes and it is done! I like to use my whipped butter piping bag to transfer everything into containers but you can use a spatula or sandwich bag (just cut a small hole in the bag). 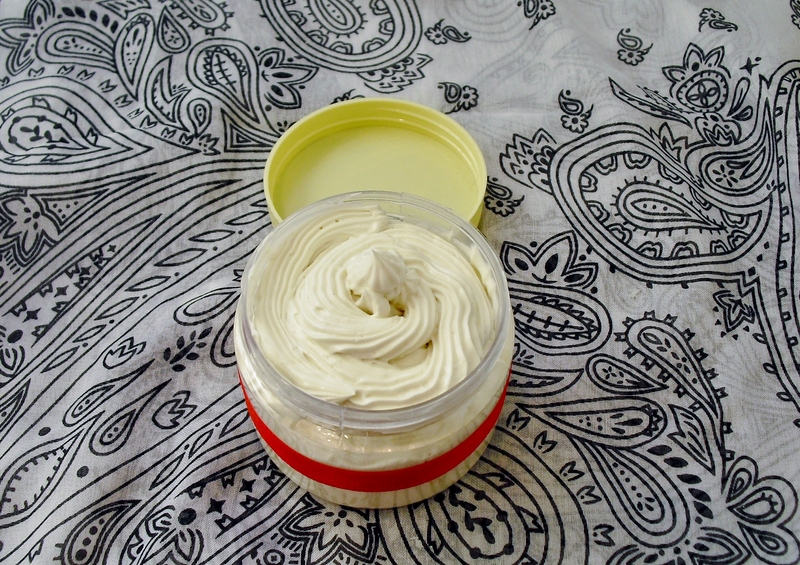 A lot of people use whipped butters in different ways and I know that some use it as a “moisturizer”. Now for me, a moisturizer needs to include water at the very least and since I do not add water (you would need a preservative to keep the mix from going rancid) using it as a moisturizer would not work (for me). So I use it to seal in moisture and it even gives my hair a tiny bit of hold. P.S. water, honey, Aloe Vera Juice and so on can also be added to whipped butters but all of the above would require a preservative in order to stop the mix from growing bacteria and expiring really quickly. How it makes my hair feel? AMAZING! Really, my hair just loves this mix! I get super soft, shiny hair that retains moisture throughout the week. I do not need to reapply the whipped butter after the initial application but because I love it so much I sometimes add a dab on my ends during the week just because. I do not keep mine in the fridge, but you could if you wish. But there is nothing in it that will make the mix “go bad” if it is not stored in the fridge. My house it pretty warm during the summer so it does become softer when it is summer but I still do not store it in the fridge. If you do, just keep in mind that the butter will become really hard but will melt as soon as it is rubbed in your palms and rubbed into your hair/skin. Where did you purchase the shea, cocoa, mango butters?